HoloLens' success depends on whether developers build enough interesting programs to draw business and consumer interest. SAN FRANCISCO — Last week, Microsoft handed off its most futuristic hardware to the people who will determine whether it succeeds. 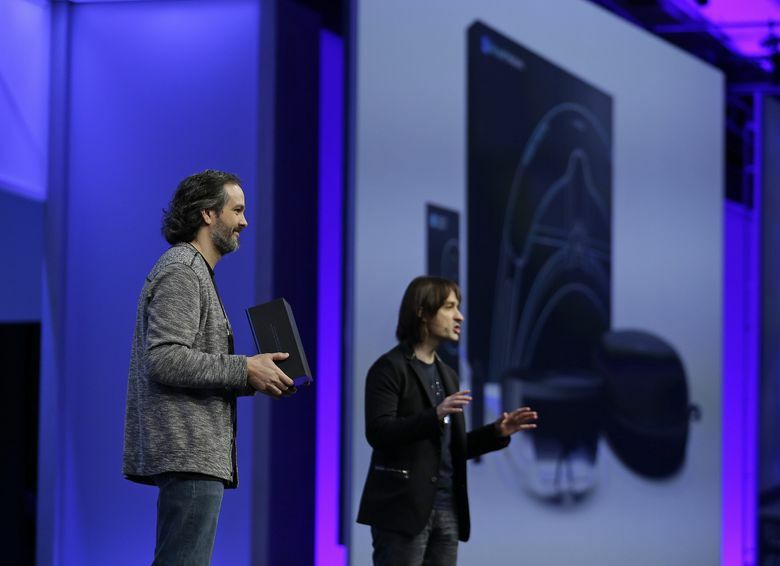 With a kind of gravitas normally reserved for presidential pronouncements, Microsoft Corporate Vice President Kudo Tsunoda strode onto a stage at the Build developers conference here holding a black box containing one of the company’s HoloLens headsets. The ceremonial first delivery kicked off what Microsoft said will be waves of shipments to developers interested in building programs for the device. The HoloLens, designed in secret and revealed to the public a year ago, is a moonshot for a company known primarily for workplace software. Increasingly small and powerful computing parts have enabled Microsoft to essentially strap a miniature PC to people’s heads, one that displays images onto the world around them. Microsoft and other companies pursuing such augmented-reality devices envision the technology as a leap forward in how humans interact with computers. Whether that leap is successful depends on whether developers build enough interesting programs to make businesses and consumers buy the hardware that, when released at a date Microsoft hasn’t specified, will likely be expensive. Tsunoda’s delivery of the first $3,000 edition tailored for developers kicked off that process. “They’ve taken it 90 percent of the way there,” said Bob Berry, chief executive at Envelop VR, a Bellevue-based builder of software tools for virtual and augmented reality. But the final pieces of that work can be as difficult as that first 90 percent, he said. Cool hardware on its own doesn’t guarantee success, and cautionary tales abound. Nokia built a series of technologically impressive Windows smartphones, but a lack of developer interest in writing apps for Windows contributed to making them a commercial dud. Microsoft pulled the plug on much of its smartphone business last year, leading to layoffs and a huge financial hit. The Xbox’s Kinect gesture- and speech-recognition device — also born amid high expectations — didn’t attract enough game developers to take advantage of its more advanced features. If the ubiquity of HoloLens here is any indication, Microsoft is exerting tremendous effort to avoid a repeat performance. 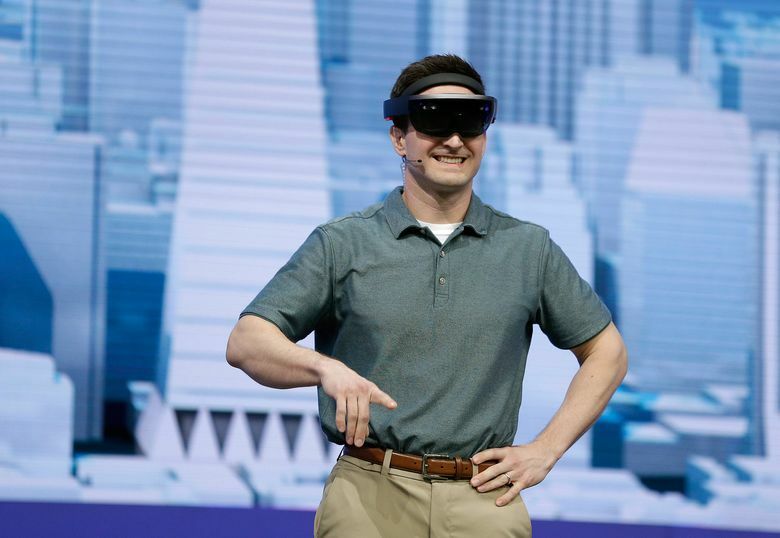 At this year’s edition of the annual conference, there were dozens of technical demonstrations of HoloLens from Microsoft employees and partners, including NASA and Case Western Reserve University. Microsoft approached company partners to develop prototype apps for the device. To avoid a repeat of Kinect’s fizzling, Microsoft has tried to seed the market with expertise in working with the device, inviting digital design and development shops and some corporate giants to experiment with HoloLens. NASA’s Jet Propulsion Laboratory (JPL), the California-based research and development center that handles Mars rover missions, was among the first groups Microsoft approached with the device. A JPL demonstration at Build showed how the hardware had progressed. Looking consumer ready, the sleek, 1.27-pound headsets are surprisingly light, though as with anything strapped to your head, they can be a little uncomfortable. Embedded spatial audio speakers make it seem like sounds are coming from specific directions, a feature that feels so natural it’s easy to forget people nearby aren’t hearing the same things. In the JPL demonstration, a three-dimensional image of moonwalking astronaut Buzz Aldrin appeared in a corner of the room, inviting guests to explore a couple of environments on Mars. From there, the demo showed both the potential and the major drawback of this first version of the HoloLens. The headset displayed a real-looking Martian landscape, built from actual mapping and images of the planet’s surface. Walking around and bending closer to the ground revealed more detail in a way that felt true-to-life. But the feeling of presence was broken at times by a relatively narrow field of view, a common complaint from analysts and journalists who have tried the device. The area the goggles project images onto amounts to about the size of a postcard held 6 inches in front of the face. That’s significantly smaller than the view in fully immersive virtual-reality headsets that completely remove the wearer from their environment. In any case, the limited virtual window hasn’t been a deal-breaker for some. Some of the earliest testers of JPL’s software for the HoloLens were rover pilots, the people who guide the Curiosity rover through its exploration of Mars. When they put on the headset, immersing the scientists and engineers in an environment they already knew as well as their own backyards, more than one finished the experience with tears streaming down their face, said Ellison, the JPL producer. JPL hopes to start using HoloLens and a finished version of its customized software to guide Curiosity sometime this summer. “What you’re going into is a bit of an adventure,” Eric Rak, creative director of Seattle digital marketing agency Pop, told developers of the device. Pop is working with Major League Soccer to build a HoloLens application to help train coaches and review game video. HoloLens is likely bound, at first, for businesses and large organizations, a fact Microsoft has acknowledged with pilots to test headsets with a range of industries. Volvo is exploring using them in a dealership showroom, while Lowe’s last week started using HoloLens at its Lynnwood store to show customers different versions of appliances. Envelop’s Berry said even a couple devices could change the way a business operates, such as architects examining a rendering of a building together in three dimensions. “Even with its limited field of view, it could have a profound impact on businesses,” he said. Matt Day: 206-464-2420 or mday@seattletimes.com.